These winding tunnels were once home to a thriving fungus-farming operation. But since war has come to Cyrodiil, they've been put to darker uses. 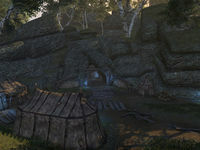 Haynote Cave is a cave in western Cyrodiil, between Castles Brindle and Roebeck containing Shadowed Path necromancers. 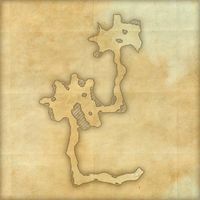 The note, Letter to Diabolist Volcatia can be found here, as can generic Shadowed Path members. The Direct Approach: Help weaken a dangerous cult. Haynote Cave also appeared in Oblivion.